Tension Fabric high quality graphic printing for custom display booth options. 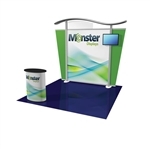 Modular displays offer flexibility – use different arrangements depending on your booth size and area on the trade show floor. The versatility of modular trade show displays make them a smart choice for growing organizations and companies with many shows to attend.